Many people don’t like to wear their holsters while driving their car and you may not always be able to carry your weapon as you get into, or out of your car. Considering such a plethora of situations, dedicated car holsters are a great way to stay safe on the road. Here we’ll talk about different types of car holsters and the great features available. We will also talk about the precautions and actions you must take when you get pulled over by law enforcement officers while you’re carrying a weapon in a car holster. Finally, we have outlined and reviewed the best car holsters on the market to help you with your buying decision. There are quite a few different types of car carry options. But for car holsters, we’ll mainly stick to only two. The first type is the strap mount holsters. These holsters can either be strapped or screwed down beside your car seats to hold your gun. The position of these holsters can be changed according to your convenience. It can be beside or beneath the seat. Strap mount holsters however, may have effect on draw times if not placed in the right position. The second type is the car holster mounts. These mounts are simple strip or button-like pieces made of strong magnets or metal which can be mounted at any concealed or properly accessible location inside your car. Holster mounts are clearly more versatile than strap mount holsters because they allow you to install them at any desired position inside your car. But these mounts can sometimes cause the gun to fall out of the holster when you drive on very bumpy areas such as off-road or over a pothole. Apart from this, there are products such as small gun safes and car gun vaults which can be used to safely carry a firearm inside your car. A car gun safe can be used to store handguns, and are often protected by passwords or biometric locks. Gun vaults are often installed in the trunk and can be used to carry rifles. A good car holster must be easy to mount. It must be compatible with different types of surfaces and should not take much time for installation. Furthermore, the installation and function of the holster should also be reliable. A car holster must also be easy to conceal, so as to prevent any curious passersby, co-occupants, or burglars to view it. A good car holster must provide quick access. Things can get out of control within the blink of an eye. Your car holster must ensure easy accessibility and a proper draw so you can attain the quickest response time. A good car holster should securely hold your gun into place. A weapon may drop out of the holster or magnet mounts on bumpy roads, while off-roading, or driving over potholes. A good holster must ensure the gun doesn’t fall out, so you don’t have to search for it and also to prevent accidental discharge or damage to your weapon. Based on the qualities mentioned above, we have handpicked and reviewed the best car holsters on the market. These holsters are the best in their category and conform to the best specification and qualities. The list below includes some of the best deals on the market, offering you exceptional value for money. The Tacticon Halo Gun Magnet is probably the most minimalist and intelligently designed car holster on the market. The gun magnets come in a two pack, where the mount is simply a neodymium magnet the size of a quarter. The mount has a recessed hole in its center which can be used to drill a screw on any surface to make it even more secure. Additionally, the mount has an adhesive backing to help you stick it before installation, or just to check various mounting places. The mount has a rubber coating which protects your weapon from any scratches. 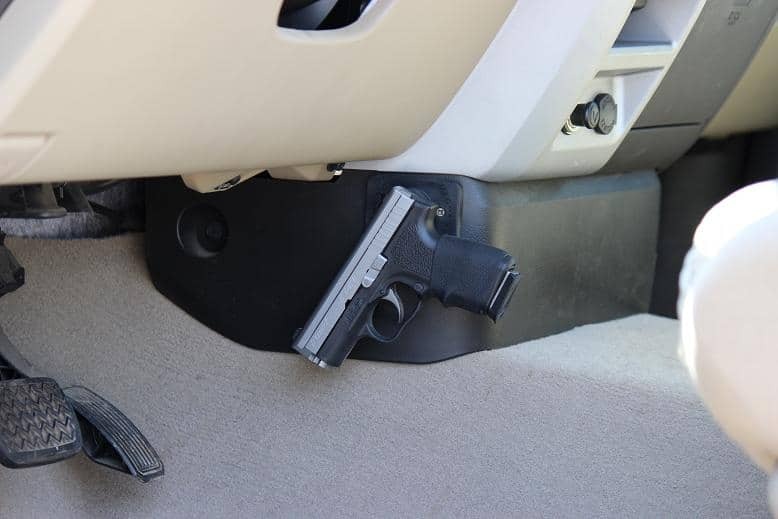 Preferred locations for mounting a gun in your vehicle are inside the glove box and under the steering wheel. These mounts can also be used to store long rifles like the AK-47. So it is a complete win-win. The Halo Gun Magnet is a very compact and easy to install solution for your car carry needs. The magnet is powerful and safe for your weapon. The company also offers a lifetime warranty which is a plus. 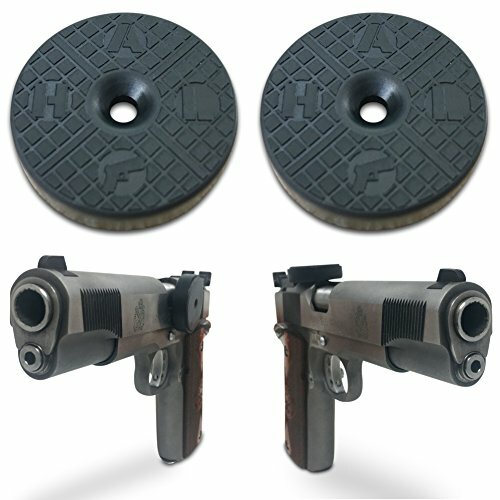 Considering the price, this pair of gun mount magnets offers the best value for money. Good for compact and mid-sized guns. The White Rhine Gun Magnet Mount is a flat, rectangular, strong neodymium magnet, which can be mounted on any surface using four screws. The magnet mount can hold weights up to 35 pounds which makes it perfect for mounting large frame pistols and revolvers. The strong magnet grip holds securely even on a bumpy road which ensures your firearm will not drop. The magnet is coated with rubber to prevent it from scratching your gun and is thick enough to allow your fingers to easily grab the weapon. This magnet mount is safe for prolonged use as it won’t polarize your gun. It can be mounted at a position most convenient to you. 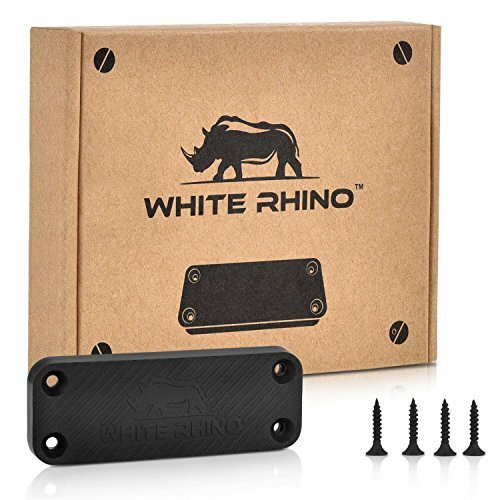 The White Rhino Magnet Mount is a safe and reliable car magnet mount. It has a huge holding capacity and is properly coated to keep your weapon secure. Magnet mounts are easy to conceal so that’s obviously an advantage. The magnet is also decently priced, offering good value for money. 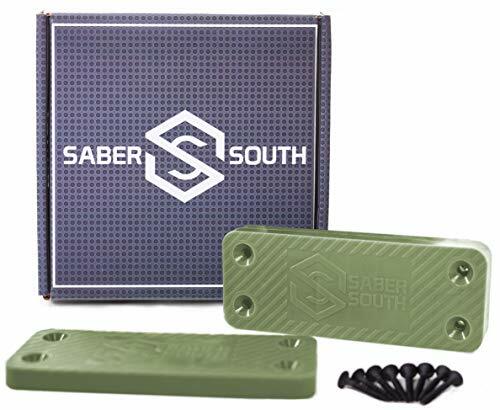 This gun magnet from SaberSouth includes a set of two magnets, each of which has a holding capacity of 40 pounds. This makes it good for holding large frame pistols, as well as rifles. The gun magnet can be mounted at discrete positions inside your car, and the large surface area ensures safety while holding larger guns. The mount is compatible with almost all gun brands, and features military grade strength. The gun magnet can be concealed easily and offers a quick draw in tactical emergency situations. The SaberSouth gun magnet is no doubt a strong magnet mount which helps you to carry all kinds of handguns and some rifles in your car. The military grade features and functionality of this magnet mount make it an exceptional and reliable product. It works with almost all handguns and will be your best bet if you carry a larger handgun. Plus it can also be installed in the trunk to help you carry rifles and shotguns. Your car’s center console is the perfect place for mounting a holster, as it is easily accessible and is a safe place for your weapon. This PUG handgun holster mount is perfect and extremely user-friendly. 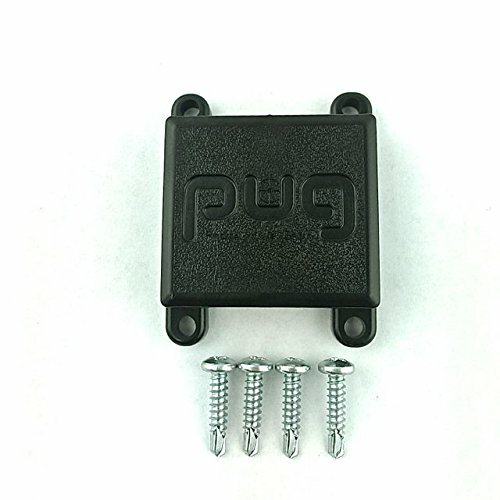 The holster mount can be installed using four screws and is made from high-grade polymer. The mount accepts holsters with metal clips up to 1.25” wide. The mount can also be used for knives, mag pouches, walkie-talkies, and any other relevant item. If you are looking for the cheapest car holster mounting option, this holster mount is for you. The PUG holster mount is an affordable, inexpensive, and effective car holster. The mount eliminates the need for a separate holster for your car. The only problem is it doesn’t work with wide belt clips, like those on Alien Gear Kydex Holsters. The multi-mount vehicle holster features an intelligent and innovative design. The mount can be installed beside the car’s seat and center console and can be adjusted as you adjust your seat. 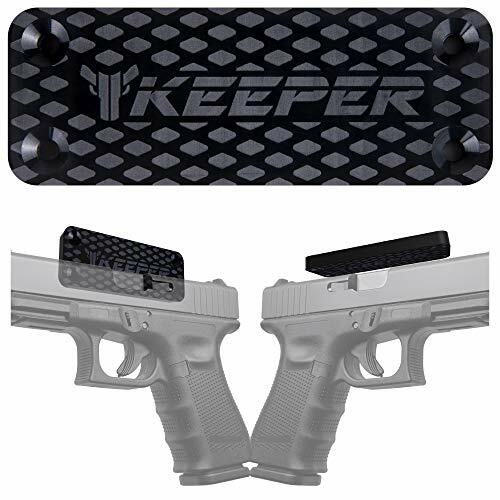 The multi-mount works with holsters and accessories with belt clips, making it convenient to carry guns, knives, cell phones, and other accessories. The holster keeps items positioned within driver’s reach at all times for quick accessibility. The mount works with many holsters so you don’t have to worry about buying a new one. Additionally, this mount offers exceptional concealment, thus protecting your gun from any prying or curious eyes. The multi-mount holster is perfect to conceal your weapon next to your seat, so you can access it very quickly. The mount can be adjusted for height and position respective to the seat. The mount works with metal clip holsters only, so please check the product if you have a Kydex holster. This one is especially for Alien Gear Holster users. This holster mount is compatible and recommended for use with Alien Gear Cloak Dock Paddle Mount holsters. The mount is divided into three sections, which combine to form a bracket. The space inside the bracket can be adjusted to create ample room for operation and different size holsters. The package includes all the accessories and required hardware for installation. The holster mount can be installed on the center console or beneath the glove box, to offer quick access to your weapon. 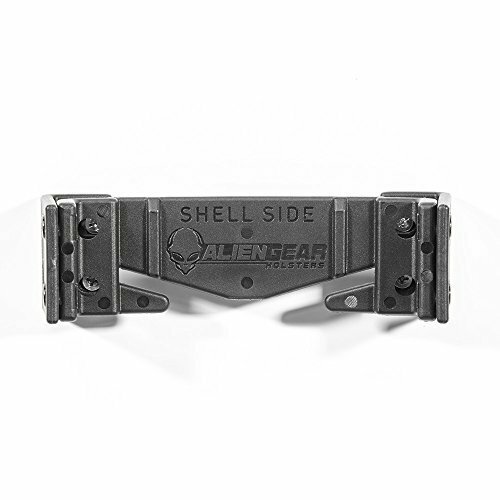 The Alien Gear Car holster mount is compatible only with Alien Gear Cloak Mod holsters. It might work with others if you get lucky, but that’s only a guess. The mount might take time to install, but it does offer quick and smooth access to the firearm. The mount is quite affordable and will work well with bigger cars. This magnetic gun mount holster is an effective car holster mount for your weapon. It will help you conceal your weapon properly and will also secure it in place due to its large surface area. The magnet works with all gun brands and models, including rifles and shotguns. 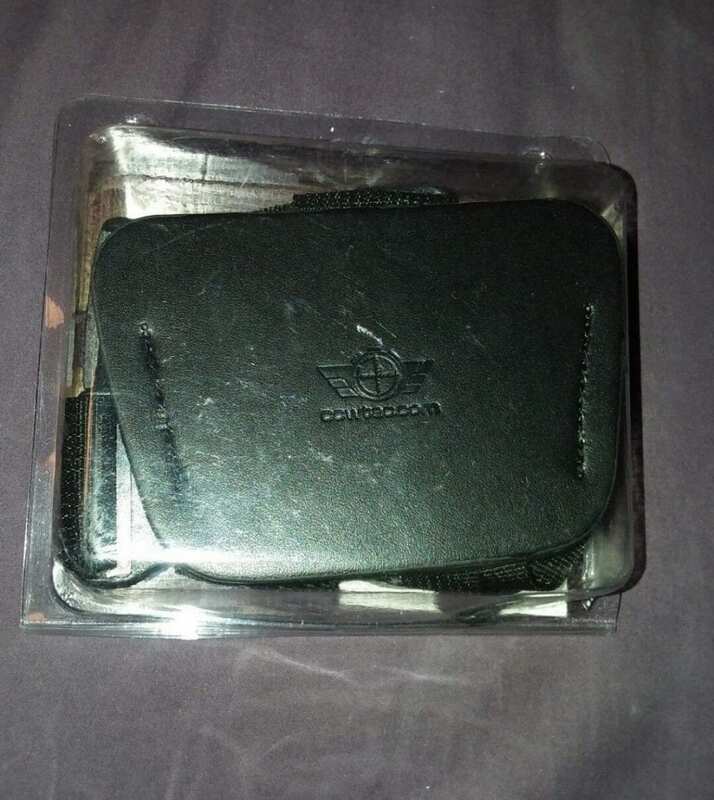 Use it beneath your dashboard, beside the seat, center console, or inside your trunk. This gun holster will prove effective and can be used inside your car or inside your home or office. The optimum low profile of the mount ensures that you get a proper grip when drawing the firearm. Magnet mounts are a good way to carry a weapon in your car. This magnet mount eliminates the need to buy a holster and keeps your weapon concealed. The high weight tolerance ensures retention of the weapon so handguns will not easily drop. The mount itself is padded, thus preventing any potential damage to your firearm. The mount is a bit overpriced compared to its counterparts, but its quality and size are still worth the money. This Ride Ready car holster is mounted under the steering wheel of your car. It offers quick access and a bit of concealment. The holster is soft on your weapon and is mounted using a nylon strap and it can be replaced if you desire. Moreover, the holster is ambidextrous, meaning you can use it for both right or left hand draw. It is not compatible with vehicles with a steering column airbag and vehicle's molding under the steering wheel must be at least 9" in depth to strap securely. The holster fits most small and large handguns. Ride Ready car holsters are a good idea, especially for women who carry a weapon in their purse. This holster sits right under your steering wheel, giving you a tactical advantage in case of an emergency. It is secured by elastic straps and has a leather holster, which is ambidextrous. First of all, gun carry and concealed carry laws across the United States are somewhat jumbled up. Some states allow concealed carry, some allow them with restrictions, and some don’t allow concealed carry at all. So if you’re on a long drive or traveling across many states, you must consider gun laws in every state you might enter. To keep things simple, you only have to remember a couple of tips in case you get pulled over (and always keep your tail light on to prevent getting pulled over unnecessarily!). First, always carry your concealed carry permit aka CCP. This is the best legal supporting document if carrying a weapon in a car holster or anywhere else in your vehicle or on your person. Without that the police have the right to arrest you if a weapon is found. Secondly, when you get pulled over, don’t make instant movements. Law Enforcement officers are trained to react quickly and be suspect of everything they see. Since you’re already carrying a gun, instantaneous movements can get you into serious trouble. Turn off the engine, roll down your window, keep both hands on the steering wheel, and calmly inform the officer when he reaches you, that you have a gun. Ask the officer what next steps he/she would like you to take. These precautions will make things easy for both you and the police officer. Car holsters are a necessity for people who have to spend much of their time driving a car or truck. IWB and OWB holsters are not always practical inside a car. 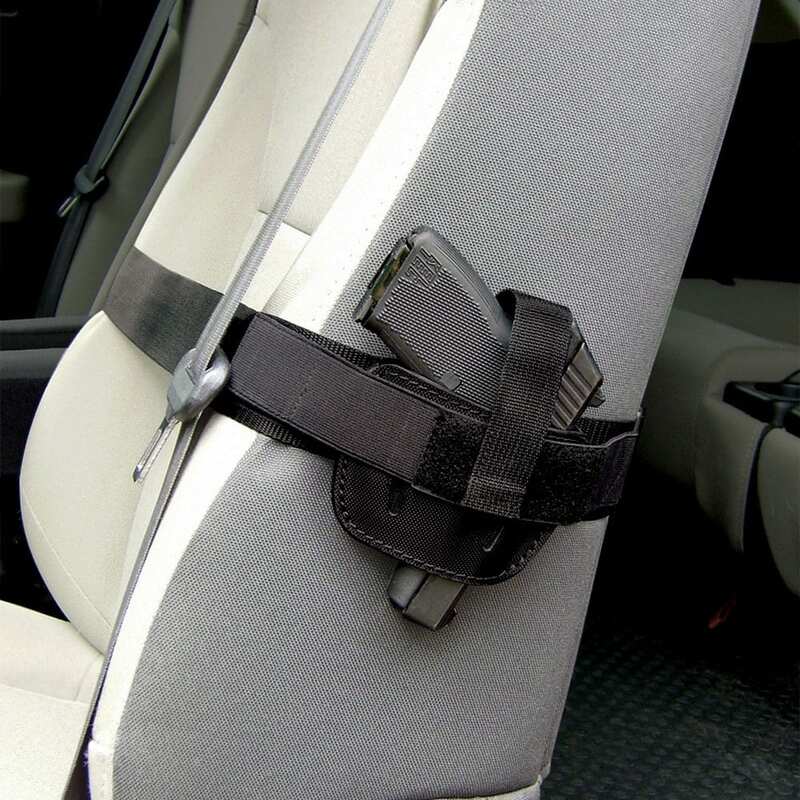 A good car holster must be easily accessible, easy to conceal, and should hold your firearm properly. Different car holster designs are available on the market which include magnet mounts, holster mounts, ride ready holsters, and gun safes inside the car. However, the final goal is to attain security and comfort. One last thing to remember is to be cautious when being pulled over by law enforcement with a weapon in your vehicle. Always follow instructions and ensure your hands are visible at all times to protect both you and law enforcement personnel.